The cybersecurity skills shortage is still a big issue in 2019, with the workforce gap reaching close to 3 million globally. According to (ISC)² research, 63% of organizations reported a shortage of staff dedicated to cybersecurity. Unfortunately, this isn’t anything new and it has big implications for the security of your business and its information assets. What is the cybersecurity skills shortage? The general deficit of professionals working in and entering the industry. The people currently employed within cybersecurity may lack the skills necessary to perform their jobs effectively. After all, you can only be an expert at just so many things. When an organization lacks skilled workers, it’s exponentially more difficult to prepare for, defend against, and respond to/recover from a cybersecurity incident. An ever-increasing number of threats requires a larger number of skilled security professionals on your staff to manage and mitigate risk. Or does it? Recruiting, hiring, and retaining a full staff of cybersecurity professionals can be vexing. The average salary for cybersecurity professionals is $116,000. It can cost approximately a million dollars annually to maintain a team of nine experts who handle your critical cybersecurity functions, including risk assessment, awareness, governance, incident response, compliance, and more. And remember, you’re not the only one looking for cybersecurity employees. 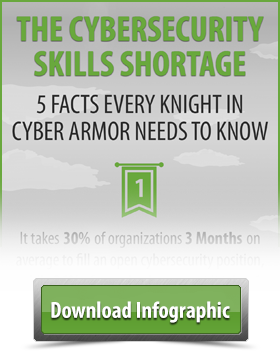 How many times per month do you think recruiters contact top information security talent? Organizations sometimes cobble together solutions to their cybersecurity woes with artificial intelligence and other technologies, but this isn’t an efficient or robust solution. It’s also not cost-effective for smaller organizations that are targeted. (No, there is no such thing as being “too small” for a cyberattack.) Truthfully, it’s time to reexamine your cybersecurity strategy. Get your very own virtual CISO and cybersecurity team. Whether you need high-level strategy or deep technical expertise, cybersecurity virtualization delivers expertise and experience in all areas of cybersecurity. Cybersecurity isn’t an IT problem. Everyone in your organization needs to take responsibility for cybersecurity, including your board of directors. You’ve seen the financial, reputational, and regulatory repercussions of cybersecurity incidents in the news. Heck, you’ve probably seen an incident in the headlines in the last month. If you want to avoid such news being about your organization, you need to address the human element of security and make awareness a core part of your employee education efforts. A serious security incident can begin or end with just one person. Build an awareness program to communicate your policies regularly and help employees understand how they relate to business goals. Take the time to ensure that everyone in your organization understands their role in protecting your information assets. With an effective framework and governance implementation, your organization can make better informed decisions on managing organizational risk, change management, creating meaningful metrics, incident management, identifying compliance requirements, and more. By following a framework, your organization will have a defensible position to enforce each policy, procedure, process, and business objective. You need to invest in the security of your business. Cybersecurity is a complex field and there is no quick fix to the skills shortage. Instead, individual organizations need to find risk management and mitigation solutions that protect their assets and align with business goals.